Wow is 2010 is over already! As I was working in my Toronto private offices the past few days, I noticed that it was much quieter than most weeks. I guess that some people had taken the time between Christmas and New Years as a vacation. It was then that I realized that 2010 is coming to a close. While I am looking forward to 2011, I am going to miss 2010. It is hard to believe that 2010 is almost over. In the span of the year things have really changed for me. I started doing more photography work for various clients. I got to work with some other very talented photographers by assisting them on their shots, I also got to do a very special shoot with a model from Detroit and had the assistance of a very well known artist setting up the model. I am getting more and more known for my photography and getting the recognition of my peers. 2010 was also great because I met a very special lady that I call my smiley girl. She is almost always smiling and her smile is the first thing that people notice about her. We met at a party back in June and have been inseparable from that time on. On Boxing Day, we celebrated 6 months together. Back in July I moved from a main floor of a house in Scarborough to a place in East York. I moved into a smaller place, but one that was closer and more convenient to my downtown Toronto office space. Instead of a 30 minute commute, my commute takes me less than 15 minutes. Well, sometimes it is longer if I am driving in rush hour traffic, but because I set my own office hours I normally drive during off peak times. I also made another move this year, one involving me moving into a private office space. The Toronto shared office space that I was using for the past few years was great, but I wanted to have a private office that I could meet clients in any time I wanted without having to book a meeting room all the time. It also allowed me to make the space my own by putting up my own pieces of art. Don’t get me wrong, the modern furnishings and artwork are great and the newly decorated lobby is bright and welcoming. I like the fact that I can also personalize my private office space at Telsec. Office space versus a virtual office: Which is best for you? 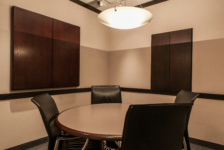 Are you paying too much for your unused boardroom?